We have O'Reilly on our radar. Bill O'Reilly, the abrasive and rather nasty Fox News commentator, was forced off the conservative news channel when it turned out he had been accused of sexual harassment by seven women and that he and Fox had paid out more than $13 million to settle lawsuits from five of them. Among the more nauseating details of his harassment history . . . he called a black female intern "Hot Chocolate." And of course, these allegations must be true, because why would Fox pay so much money to keep things nice and quiet? Liberals are applauding this move, as they should, and some of them think this marks the end of the dominance of right-wing news commentary, as O'Reilly's show "The O'Reilly Factor" was the highest-rated show on the highly-rated Fox News Channel. Indeed, it's being called a turning point in how harassment is being dealt with. Well, let me dispel all that by pointing out a couple of things . . .
Tucker Carlson replaced Bill O'Reilly is his old time slot and delivered ratings numbers just as high as Bill's. O'Reilly is getting a golden parachute of $25 million - a payout almost twice that of the sum paid out to those previously mentioned five women. When a black man like Bill Cosby sexually harasses - nay, rapes - women, he is deservedly made to pay for it. 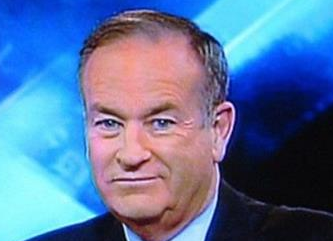 O'Reilly should also be made to suffer, so why is getting twenty-five million bucks for bad behavior? And if the popularity of right-wing commentary is fading, why is Sean Hannity - who makes O'Reilly look like Eric Sevareid by comparison - still on the air? O'Reilly's departure from the TV airwaves treated a symptom of the disease plaguing American civilization. The disease itself goes merrily on.